Calibrating the Slabsmith photostation is always unique to each customer. Yet the general guidelines are always the same. This FAQ will help you understand what an ideal setup looks like. Normally, the only camera setting that you expect to change is the aperture (f-stop). Ideally it will be in the middle of the f-stop range for that lens, which tends to be the sharpest aperture for the lens. You also want to avoid very high f-stops, like f22, because it can introduce other lens artifacts like airy disks and introduce diffraction limiting issues. Ideally, we are trying to recreate the sun. This means we want a very powerful light source from very far away. Since we haven't figured out how to keep the skys clear and the sun in one spot, we have to try to simulate the sun as much as possible with multiple flash units. Just like our ideal, we want to have them at maximum power, and as far away as possible without having to increase the ISO sensitivity or widen the f-stop. Don't use umbrellas or other light modifiers. They reduce the effective output of your lights and rarely have a valid use. It is best if your lights are permanently fixed in location. If you must move the lights for safety reasons, such as lights placed in a aisle, use pins on the light stand and holes in the floor to make sure you can accurately reposition your lights when it is time to take a photo. When you take your calibration photo, if you see focused hotspots, it means you need to move your lights further out to the sides. If this is impossible because of a wall or other obstacle, you may have to move the lights forward and may need to turn the power down to compensate. 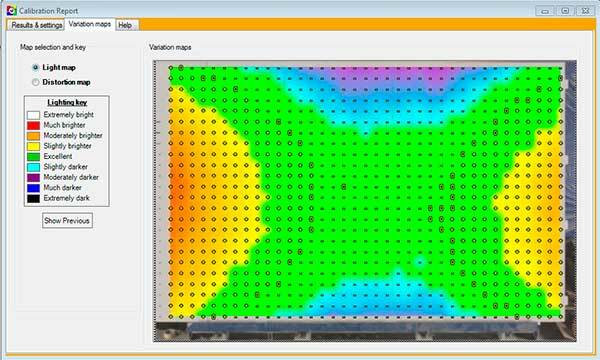 It's important to note that our calibration grid is much larger than any slab you will be photographing, so if your hotspots are in areas that are beyond the extents of your slabs, you don't need to worry about them. 1: Your lights are close to the grid and not powered as high as they should be. Ideally, move the lights further away and set them to full power. 2: Your lights have unnecessary light modifiers, like umbrellas. Take the umbrellas off, turn the lights so they are pointing at the grid, make sure they are on full power and reshoot. This can be caused by a wide variety of things. Random underexposed regions can be caused by a dirty calibration grid. Make sure it is clean and that there isn't any tape or other issues in the immediate vicinity of each dot. Strips of underexposed dots at the bottom of the grid can be caused by a large ledge for the slab. Raising your lower lights may help with this. Inconsistent exposure where grid panels join can be caused by warped calibration panels or panels that are not properly supported. Ideally we want to have a perfectly flat grid, so if any panels are improperly joined or are bowing in any direction, add additional support and consider taping the top and bottom edges of each seam together. This can be caused by very surprising things. For example, a large yellow forklift near the lights can add a yellow cast to your slabs. Do your best to make sure that the immediate area around the photostation remains constant. Most white balance issues can be adjusted out with the white balance shift grid. Make sure your main white balance is set to flash, then look at the numbers we provide for the red, green, and blue channels. For example, if there is too much blue (positive numbers on B) add points towards amber to reduce the blue points. If you need more red, shift the white balance towards magenta. First time calibration is an iterative process. After setting your camera and lights, try to get a consistent lighting pattern before worrying about your exact exposure or white balance settings. Once the initial calibration is done, recalibrating, or doing additional calibrations for different thickness slabs, is very straightforward and will not take much time. It is very important to make sure that your camera never moves in any way once calibration is done. We even recommend putting electrical tape on the focus and zoom rings of the lens to ensure they do not move. Calibration is easy if all you care about is dimensional accuracy. Simply pointing the lights at the grid and getting the exposure close to right will give you digital slabs that are at least accurate in size. Good lighting will make a huge difference in your ability to color match digital slabs with confidence. It's worth it to spend the up front time to get your lighting as close to perfect as possible.